After probably two years of procrastination, I get it together to head to Riverside on a Saturday to check out two classic restaurants and a used bookstore — with the spur being two PST: LA/LA art shows, now on view. I write about the day trip in Friday’s column. 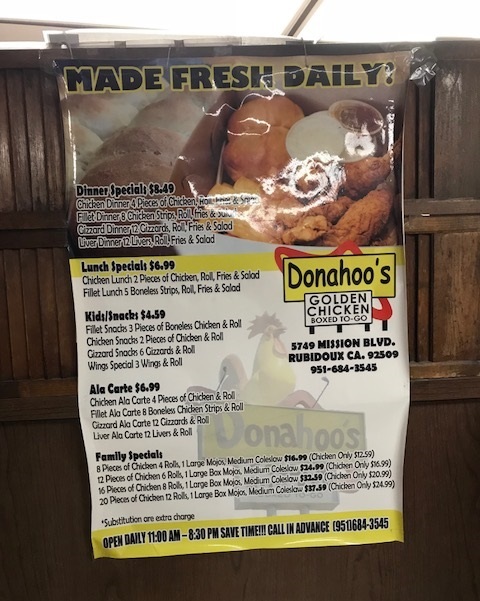 Only three Donahoo’s chicken locations remain, I believe: Ontario, Pomona and Rubidoux, which is just west of Riverside. The chain’s history isn’t well-documented, which I’ll have to rectify sometime, but there used to be more locations around the state. I’ve been to Ontario once or twice and to Pomona dozens of times, which is more a reflection of where I am when I want takeout rather than the relative quality. I’d never been to or seen the one in Rubidoux, but it was in my mind to try it one day. That day came last Saturday, when I drove to Riverside for the afternoon. 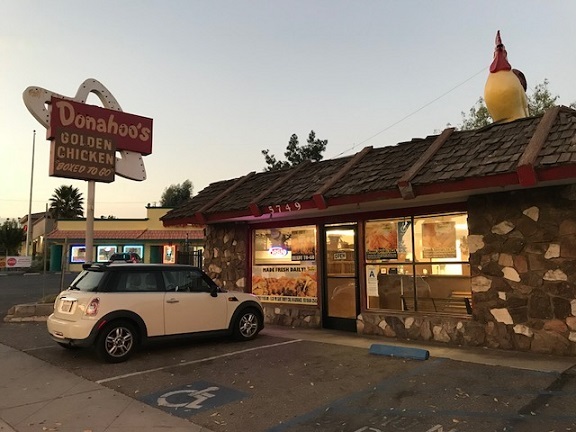 I ended my day at Donahoo’s, taking Mission west out of town and pulling up to Donahoo’s, in a standalone little building with what must be an original 1950s-’60s sign. It was kind of adorable. There’s only a couple of parking spaces, but the lot next door is good too since you won’t be there long. It’s takeout only, just like the other Donahoo’s. I got the chicken strips box lunch ($7.55), which came with five pieces, a small salad, a roll and fries. They cook the chicken to order and it was ready in 10 minutes, handed over in a brown cardboard box inside a plastic bag. I got on the 60 Freeway when it met Mission at Valley View, headed home and ate there. 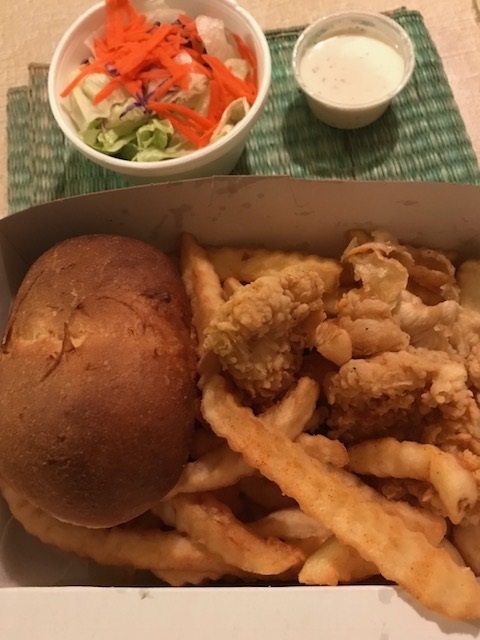 It was a different meal than Pomona: crinkle-cut fries, which they also do in Ontario and which are the original style, rather than the Pomona steak fries; a green salad, rather than slaw or macaroni as in Pomona; and a different, lighter batter for the chicken. It tended to slip off the chicken, which was disconcerting, but the taste was good. I liked the fries and roll; the iceberg salad was meh. I ate half the meal that night and saved the other half for lunch the next day. Not bad for $7.55. I would return, but probably won’t, given there are closer Donahoo’s, but I’m glad I went and am glad this one is still around. 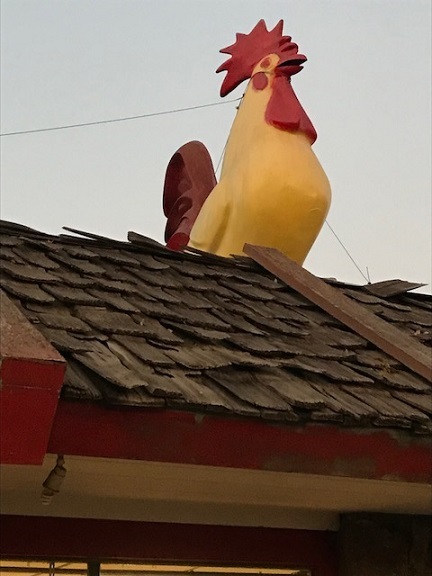 And yes, like Pomona but unlike Ontario, there’s a rooster on the roof. 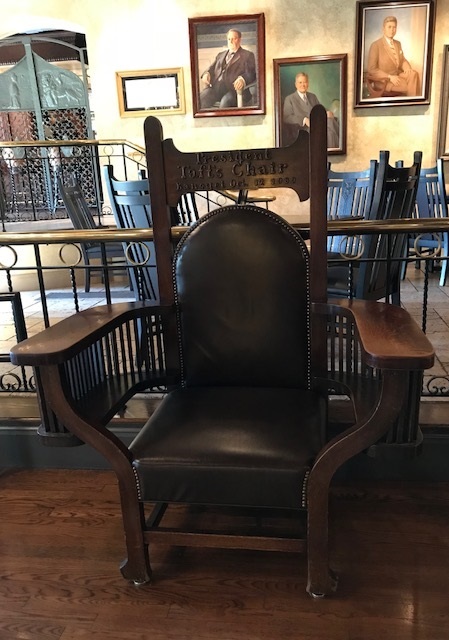 Have you seen the Taft Chair at Riverside’s Mission Inn? When President William Howard Taft visited the baroque hotel in 1909, a special chair was built to support his 350-pound frame. This followed an infamous incident in which the 27th president got stuck in a bathtub and it took five men to haul him out. Taft is said to have initially declined the chair but was persuaded to use it, which he did under the proviso that he not be photographed in it. 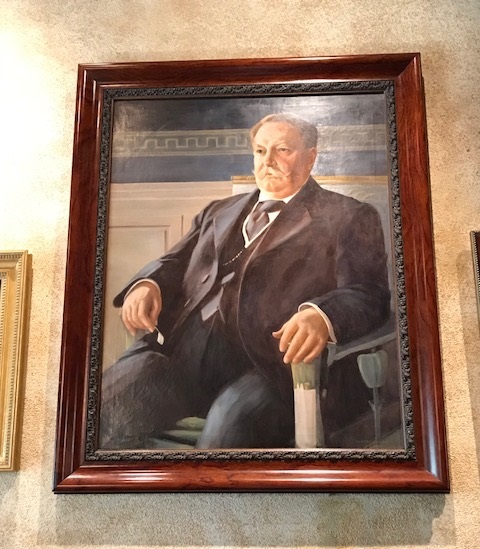 It’s there in the Inn’s lobby, where anyone can take a load off — but probably not as big a load off as Taft could — and unlike Taft will welcome being photographed doing so. A few paces away is the grandly named Presidential Lounge and portraits of the 10 presidents who’ve visited the inn. In other excellent trivia notes, Richard and Pat Nixon were married in what is now the Presidential Lounge and Ronald and Nancy Reagan honeymooned at the inn. 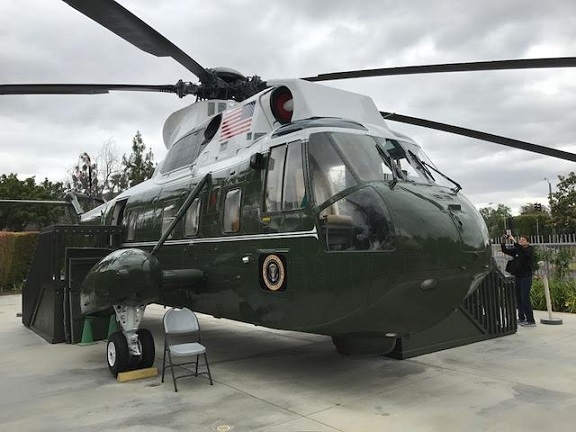 I’d idly wanted an excuse to visit the Nixon Library in Yorba Linda since its overhaul in October. With all the comparisons of Trump and Nixon the past week or two, a light bulb went off and I decided now was the time. I visited Wednesday morning and write about the experience in Sunday’s unexpected column. Above, Army One, the helicopter that flew Nixon away from the White House on Aug. 9, 1974.